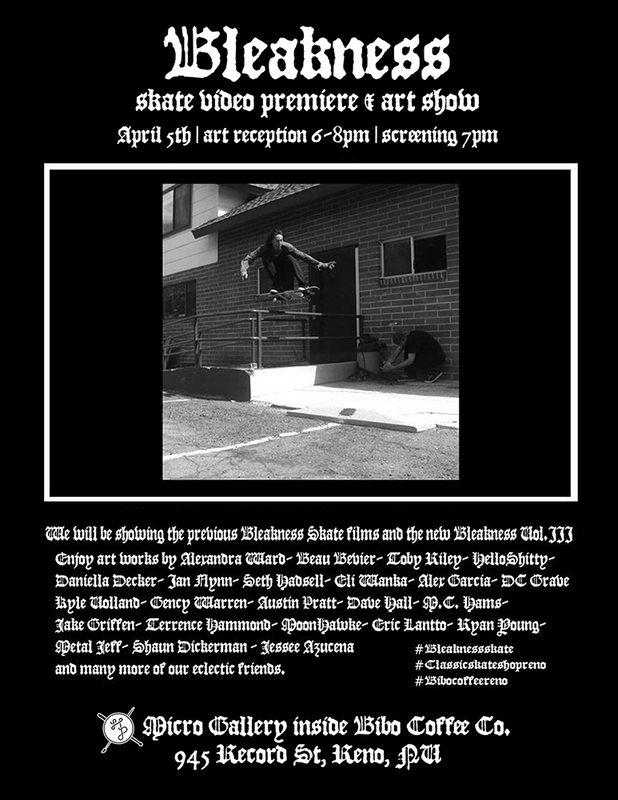 We’re stoked to team up with Dean Christopher from Classic Skate Shop to host the Bleakness skate video premiere and art show in the HP Micro Gallery! In addition to the previous two films from the series we’ll also be screening the brand new Bleakness Vol. 333. The video premiere and art reception is set for Friday, April 5th 6-8pm with the screening starting at 7pm. Come chill with us!! If you miss the video premiere on April 5th, don’t fret! You can still catch the art exhibit, which will be on view through May 3rd. The Holland Project Micro Gallery is located inside Bibo Coffee Co. at 945 Record St, Reno, NV. Neon Wasteland is a selection of mobile photography pieces focusing on the various unrealities and nuances of Reno. The work derives from a series of predominately abstract photographs taken at night over a year’s time. The resulting large collection of photographs has been distilled down to a smaller thematic set for this show. The work plays with the liminal space of nighttime and its peculiar interaction with dreamlike sensibilities of a decaying casino town, capturing its transition between identities. Marie Sophia Sevier Dyer is an artist and writer living and working in Reno, Nevada. She focuses primarily on photography; though she also works in traditional media and video. Besides being an artist, she is a writer and poet. Her interests not only include fine art but also commercial and editorial endeavors. Dyer has her degree in in Art and in Writing. She has shown and published locally. 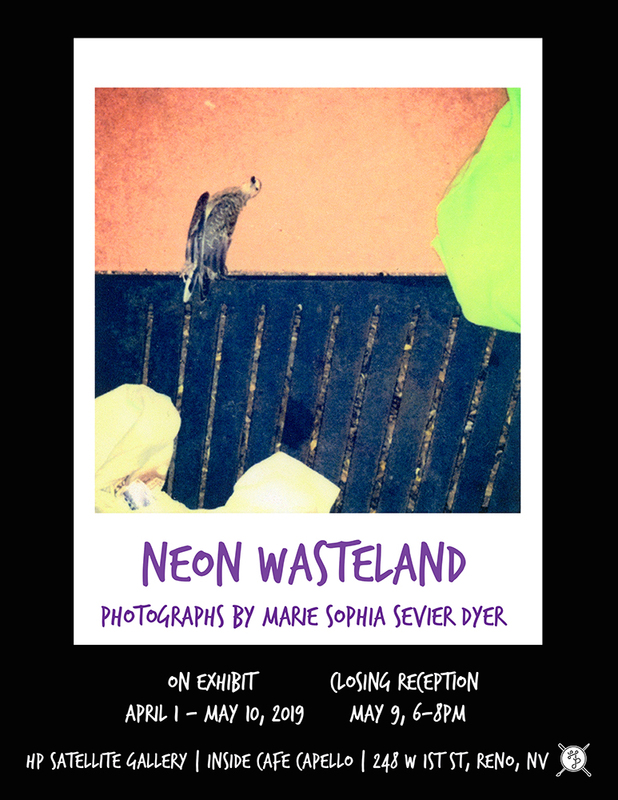 Neon Wasteland is on exhibit April 1st – May 10th with a closing reception on Thursday, May 9th from 6-8pm. The Holland Project Satellite Gallery is located inside Cafe Capello (former Java Jungle) at 248 W 1st St. #202, Reno, NV. Organized and run by the Gallery Associate, our off-site Micro Gallery and Satellite Gallery supports emerging creators both as curators and as exhibiting artists. The Gallery Associate is a high school/college level intern that has the opportunity to oversee and curate full exhibitions in both off-site art spaces from start to finish, beginning with the selection of the artist/s and completing with de-installation of the exhibit. For exhibiting artists, both the Micro Gallery and Satellite Gallery allow an avenue to exhibit work professionally in a high traffic space in the heart of Reno’s university neighborhood and downtown river district. Special thank you to Paul and Deb Martin at Bibo Coffee Co. and Cafe Capello for their support. The HP Micro Gallery is located inside Bibo Coffee Co. at 945 Record Street, Reno, NV and the HP Satellite Gallery is located inside Cafe Capello located at 248 W 1st St #202, Reno, NV. To see what came before in our off-site galleries, check out OFF-SITE GALLERIES PAST EXHIBITS.